This unique, complex project was created for a large family. As such, the emphasis was on maximum storage and precise measurements. 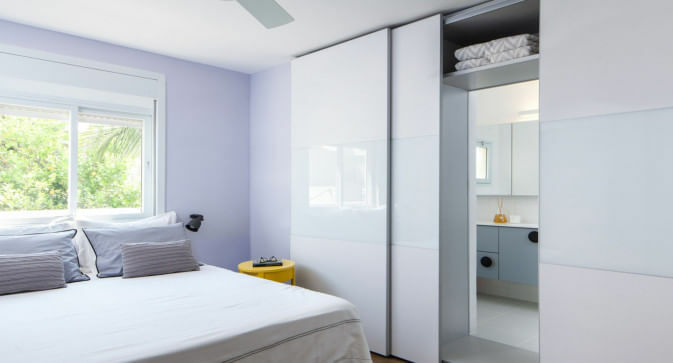 The closet used for this project was Hardoor’s level surface Sesame closet in glass and wood. This combination creates an elegant and upscale look that is also well designed. The issue of well-planned storage was addressed by using highly functional solutions. The uniqueness of this closet was in the use of external floating doors that do not detract from the depth of the closet (unlike conventional door systems), enabling better organisation within the closet, improving the user’s experience. These solutions were developed in order to improve the day to day life of the consumer allowing better ease of use, improved accessibility and ergonomic design. In addition the client asked for the closet to fit seamlessly in the room such that it would not disrupt the harmony and brightness or the spacious feeling of the space. We used shades of white and cream to achieve this goal. The closet was installed along the corridor leading to the bathroom providing functional, efficient use of space in the most stylish way possible.